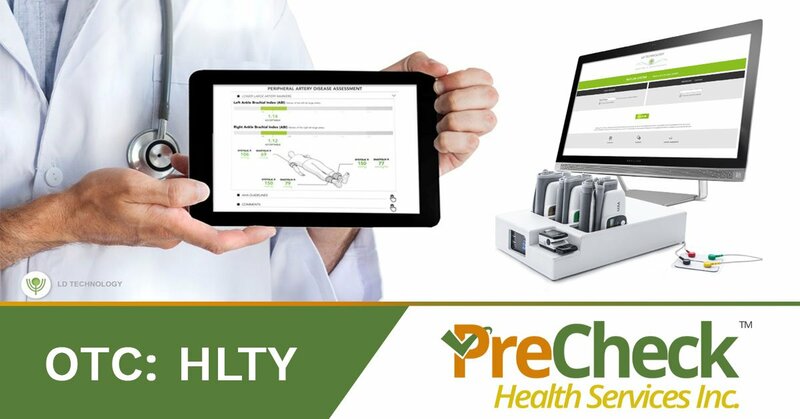 PreCheck Health Services Inc. (“PHSI” or the “Company”) is a Florida corporation focused on the exclusive U.S. distribution of a medical diagnostic device, the PC8B. The PC8B medical device is a powerful diagnostic tool in managing patient’s health. Scientifically validated and FDA cleared, this medical device performs a range of tests that are covered and reimbursed by most insurance companies. The manufacturer holds multiple patents on the device and continues to evolve the technology. This system is non-invasive and combined with a fast ABI (Ankle Brachial Index) test, takes less than 8 minutes to complete an assessment. The device provides physicians with a one-page comprehensive overview of a patient’s health at-a-glance. The screening system provides patient insights covering 8 key risk factors. Depending on the risk score for each factor, the physician will be able to determine the best course of action to resolve the patient’s condition, as well as motivate the patient to immediate action. The Company’s headquarters are located in Denison Texas. The Company’s CEO, Mr. Lawrence Biggs has previous public company experience. He was the Chairman and Chief Executive Officer of Max Internet Communications, Inc., (NASDAQ:MXIP), which was focused on sales and distribution of specialty computer hardware that enabled high-resolution video conferencing. At its peak, the company reached a market cap of over $1.2 billion dollars. The operating team has extensive experience in marketing, processing, billing and screening of the PC8B device, as well as having the deep medical knowledge regarding early detection of disease. Under the Affordable Care Act, physicians are required to provide more preventive care than previously required. Insurance companies as well as Medicare and Medicaid have learned that preventive care will reduce their cost of insuring patients. If diseases are detected early, then the patient may not require care for a chronic illness, which will save tens of thousands of dollars for care over the life of the patient. Physicians have not previously had the technology available to them to provide the early screening necessary to recognize the early signs of disease, and there was not a strong enough monetary incentive to provide such preventive care. The PC8B provides data from screening the patient which assists the physician in addressing care in a way to prevent disease. The screening is also highly reimbursable from the insurance companies as well as Medicare and Medicaid therefore providing a significant revenue for the physician’s practice. The PC8B is placed with physicians under a licensing agreement with PreCheck Health. The PC8B is placed in the physician’s office and patients are tested and screened on site. The physician is reimbursed for the screening test by most commercial insurance carriers as well as by Medicare and Medicaid. The level of reimbursement varies by payor as well as the state and county. PreCheck Health derives its revenue by providing the PC8B as well as managed services including billing and processing for the testing. PreCheck Health is paid a fee per executed test. The Company also provides ongoing customer service to assist medical practices with guidance and education regarding the PC8B.